Samskruti Alumni has formed to promote and foster mutually beneficial interaction between the Alumni themselves and the present students of the Samskruti College of Engineering and Technology from all courses offered i.e., B.Tech., M.Tech and MBA. 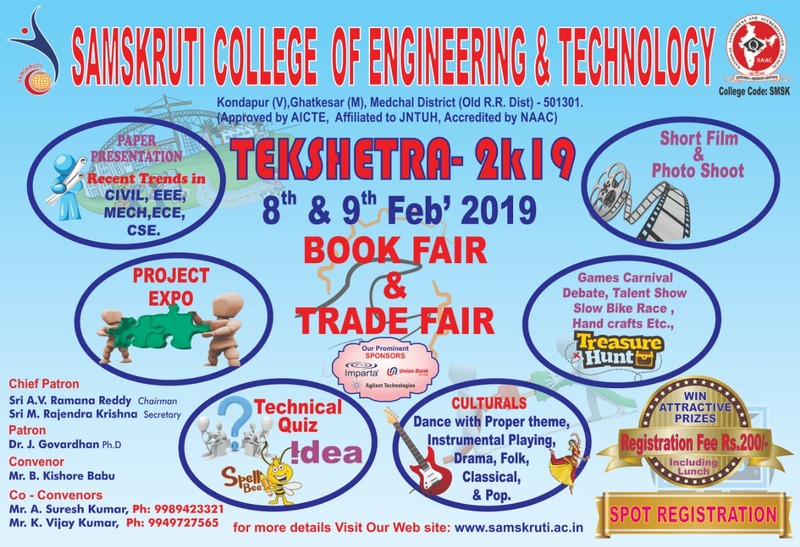 To promote and foster mutually beneficial interaction between the Alumni themselves and the present students of the Samskruti College of Engineering and Technology from all courses offered i.e., B.Tech., M.Tech, MCA and MBA. To encourage the Alumni to take an active and abiding interest in the work and progress of the Institute so as to contribute towards enhancement of the social utility of their Alma Mater. To organize and establish scholarship funds to help the needy and deserving students. To Institute prizes and awards for outstanding project work and other professional activity by the students of the Institute; also to suitably recognize outstanding social and community service by the Alumni and the students. To organize the activities of a civic and charitable nature to increase public awareness of the role of technology in value addition to the economic and social development of the Nation. To invest and deal with the funds and moneys of the Association. To do all such other lawful things as are conductive or incidental to the attainment of the above objectives and/or beneficial to the interests of the Institute and its Alumni. To take advantage of developing technologies in achieving the aims and objects of the Association.